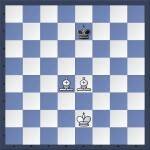 The bishop checkmate can be one of the trickiest. It’s very easy to fall into a stalemate trap or to accidentally give the defender an escape square. Try it against a friend and see if you can do it. A typical solution, my game against Fritz 12, is below. It took me 21 moves and was by no means a perfect execution. Two things to remember are that the bishop can ‘lose a move’ by meandering about on a diagonal. This means that you are essentially keeping the same position but forcing the opponent to move. This can be a very useful tactic. White’s fifth move is good representation of this. 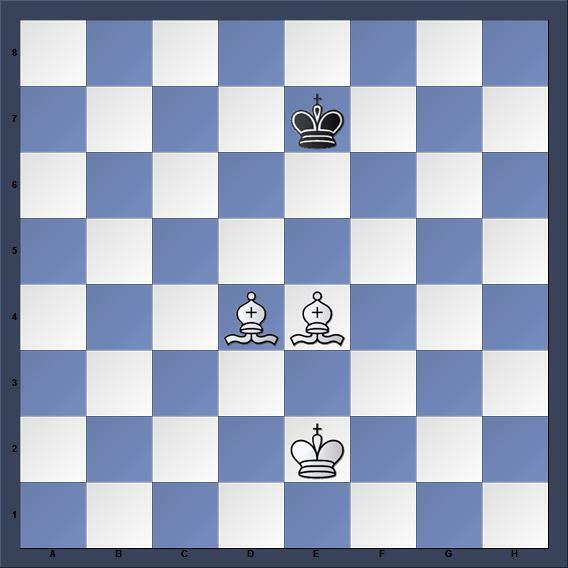 You’ll also notice that there are situations where the bishops and king can limit black to a choice of two moves. Be very careful in these positions as you can easily throw the game away. Endgame positions are great to know when they come up, but their real value is that they reinforce the sometimes hidden qualities of the pieces. The little chessmen in front of you can perform all sorts of tricks. Keep in mind how the bishops work together to rake the diagonals and control key squares. Note that hypothetically if you had two bishops of the same color you could not deliver checkmate! Black would find a safe haven on the squares of the opposite color. Thus it’s wise to hold onto these wonderful bishops unless the game is very closed or you otherwise have great reason.